Decided to give C.N.N. a chance. you know, same ole song and dance. could not be held in Broward County. afraid the jury's votes would not be counted. Trial moved to the land of fruits and nuts. Stu was safe in a sanctuary city. when greeted by a welcoming committee. Stu, found innocent of all charges. My fault, now a defense I must mount. I left the bike running in the street. exceeding my Co2 carbon count. Regarding the escape from prison. a place he never should have been. The jail supposed to be a gun free zone. If Stu used guns to escape, the jail's at fault then. They said no, he could not live there. now made Stu the squirrel, a millionaire. Welding, trying not to start a fire. 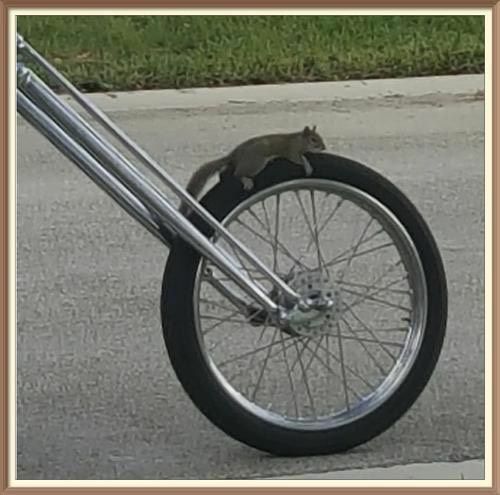 There he was, asleep on the front tire. I still feel sorry for Stu. He rode a chopper few can ride. When I saw the security tape. I was mad, but my chest swelled with pride. I decided to give Stu another chance. To see if he can make things right. Have the nest from a cat carrier. So I can always keep him in site. I hear the ducks have formed a gang. They don't want Stu on their turf. Claims he is wacky and deranged.